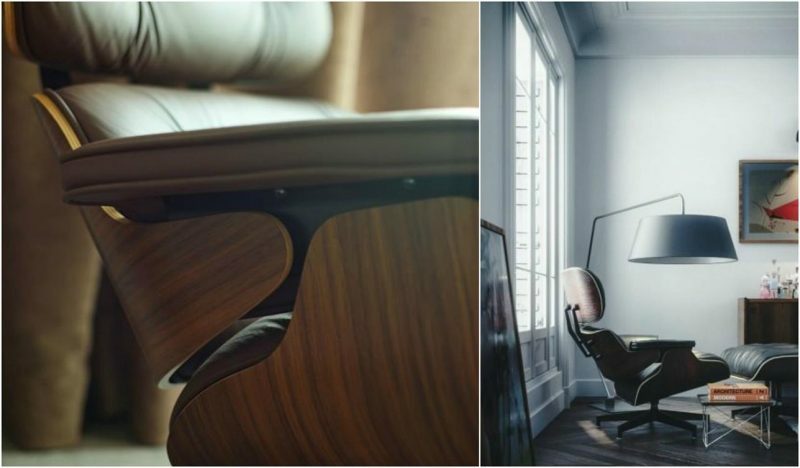 The Eames lounge chair and ottoman are synonymous with mid-century modern design. It is certainly a piece, that within this period has become a benchmark of superior design. Notorious for their mass-produced pieces, the lounge chair was in fact the Eameses' first luxury item designed for a high-end market. Inspired by the traditional English club chair with a modern, comfortable appeal, Charles Eames explained his vision: "was for a chair with the warm, receptive look of a well-used first baseman's mitt." After years of significant design development, (examples of these furnishings are part of the permanent collection of New York’s MoMA) they completed it in 1956. 60 years later it rightly claims its supreme iconic status and is a stunning, statement piece in almost any setting. It has a weighty and inviting quality that can transcend the style of the room it is placed in and almost looks better in contemporary settings, adding not only a sense of history and timelessness but also softness in otherwise pared-back, hard-lined schemes. We have the Eames style lounger and ottoman in chocolate and antique brown, black and white online at: http://www.cadesign.ie/furniture/lounge-chairs/charles-eames-style-lounger-and-ottoman/ or visit us at CA Design, 23 Dunville avenue, Ranelagh, Dublin 6 or call 01 4979553. The Eames style lounger introduces curves and comfort into this otherwise hard-lined setting. White leather also has a bright, contemporary appeal where black/ tan etc can look heavy or retro. Our Eames style loungers look at home in a multitude of settings and exude a stylish and inviting look. The years of design development - creating a lounger composed of 3 plywood veneer shells has more than paid off. The Eames lounger is an exemplary piece of beautiful craftsmanship and looks seriously good from every angle. The chocolate leather Eames style lounger compliments the patterned veneer base and creates a tactile, sensual statement-making piece.